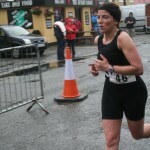 A small gang of Kenmare triathletes took on the first Sneem Sprint Triathlon on Sat 25 June last. Yet again, the conditions were unseasonal, with mist, rain and wind that the weather forecasters promised would lift hanging around until the bitter end. The swim was an out-and-back course on the tidal River Sneem. Although almost high tide, all the recent rain ensured the river was still in full flow and the second half was a tough enough slog upstream. The cycle took us 10kms along the road to Castlecove and back again. A small hill (by Kenmare standards!) stood in the way but ensured a zippy journey home. The run was another out-and-back course up a bóthairín, with the town centre finish line ensuring a warm reception for the finisher. 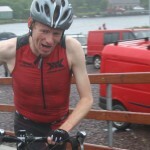 Despite the conditions, a nice race and a welcome addition to the calendar for Kenmare sprinters.